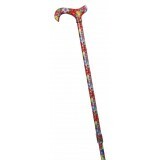 A pretty walking stick ensures its user feels fashionable and elegant. A walking stick need never be frumpy or dull. Whether a delicate floral or a bold animal print, a patterned cane is an expression of style and individuality as well as a fabulous finishing touch to any outfit. Much of the charm of a fashionable cane is in the details: elegant and comfortable handle shapes, expertly chosen colours and patterns, and our detailed understanding of what makes a walking stick user feel well-dressed. A very fashionable and elegant derby cane. 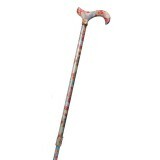 The pattern is of bright blue and pink-red flowers wit..
A very fashionable and elegant derby cane. The pattern is of small pale pink and blue flowers wi..
A very fashionable and elegant derby cane. The pattern is of peach, yellow and blue flowers on a..
A very fashionable and elegant derby cane. The pattern is of little blue and pink flowers with g..
A very fashionable and elegant derby cane. The pattern is of yellow and lavender flowers with gr..
A very fashionable and elegant derby cane. The pattern is of red grapes with green vine leaves o..